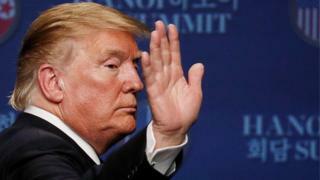 Trump Kim talks: What to make of the Hanoi summit collapse? Image caption See you at the next summit? The second summit between US President Donald Trump and North Korean leader Kim Jong-un has ended without any deal or agreement. Washington insists though that dialogue with Pyongyang will continue and the collapse of the Hanoi summit is not a major disappointment. Here's a roundup of North Korea experts looking at the summit and what to make of its sudden end. The "no deal" outcome could have been seen coming a mile away. Indeed, a serious reading of public North Korean statements since last year's Singapore summit would have revealed the core issue that resulted in a lack of agreement. The day after the Singapore summit, North Korean state media paraphrased Kim Jong-un as noting Pyongyang would take "additional good-will measures" if the US took "genuine measures." By that date, North Korea had dismantled its nuclear testing site at Punggye-ri and announced a moratorium on nuclear tests and intercontinental-range ballistic missile tests. Weeks later, North Korea would also partially and reversibly dismantle a missile-engine test stand. When Mr Kim met South Korean President Moon Jae-in for a third summit in Pyongyang last September, they referenced North Korea's nuclear facilities at Yongbyon as an example of something the North would put on the table in exchange for "corresponding measures" from the US. Finally, on 1 January this year, Kim Jong-un made the same point in his New Year's address: corresponding measures would lead to progress in the US-North Korea diplomatic relationship. This phrase was misinterpreted to mean any range of US concessions, including a possibly a declaration to end the Korean War, when it really meant sanctions relief. Critically, the sequence matters to North Korea: the US would have to agree for sanctions relief up front for any further concessions on denuclearization to flow. In effect, Yongbyon will remain off the table until the US provides sanctions relief. Donald Trump confirmed this is precisely what caused the breakdown of talks at his press conference on the second day of the Hanoi summit. As long as Washington remains unwilling to take the first step on sanctions relief, this process will likely remain stuck. The longer it remains stuck, the more likely it is to collapse. Waning momentum in the US? It is surprising that they didn't come away with a preliminary deal, as they clearly had the outline for one going into the final round of pre-summit negotiations. The tone of the press conference was relatively positive, indicating that the administration still sees a way forward and intends to continue negotiations. That's encouraging for now, while also offering some relief to those who thought the US would accept a "bad deal". However, in the meantime, no concrete obligations have been placed on either side and I would suspect that offers of confidence building measures that we've seen coming from North Korea in the past - such as dismantling of the nuclear test site - are unlikely to continue. Of all the stakeholders in this process, the lack of movement on the US-North Korea agenda puts South Korea in a very awkward position, unable to secure the sanctions exemptions they were hoping for as part of this deal, which would facilitate the resumption of inter-Korean economic cooperation. Moreover, despite the president's stated will to continue negotiating with North Korea, in the current domestic political environment, there is a real risk of the momentum for this issue waning amidst a sea of competing interests. Fundamentally, this summit was supposed to kick off a process through which the two countries were going to try to move to a more win-win relationship, rather than the zero-sum "I win, you lose" frame that has dominated US-North Korea relations since, well, forever. As such, you have to say that everybody lost. From Mr Trump's perspective it will be a loss he can weather, however. A "bad deal" in which he gave away a lot would inspire years of debate and pushback from US foreign-policy elites. With this, he's spun it as save-able through working-level talks and will head home and the news cycle will move on. This is the risk for North Korea. Momentum is hard to build between these two countries and there is every chance now that Donald Trump becomes distracted by politics in the US and this window of opportunity closes. Who knows who the next president will be and what he or she aspires to with North Korea? That the North Koreans went into this agreement demanding "all sanctions" be lifted, as Trump said, suggests there is an increasing desperation on the part of Pyongyang for relief, and that they see any other kind of deal as essentially pointless - we'll have to see their response in the coming day. It is also a major embarrassment for the South Korean government, which had planned a major announcement on the "Future of Korean peace and prosperity" tomorrow and had hopes for a major expansion of cooperation with the North in the wake of this summit. China and Russia, too, will be very frustrated with this outcome. The mood in Pyongyang may be tempered, however, by Mr Trump's comments that he will not increase sanctions against the country, and that he would "love" to see them lifted in the near future. The message is that while no formal relief is going to happen anytime soon, the days of "maximum pressure" are long gone. President Trump made the right decision to walk away from a deal. North Korea's ask to remove all sanctions was untenable and also illegal. According to US and UN sanctions, sanctions cannot be removed until complete, verifiable, irreversible dismantlement of North Korea's nuclear program takes place and the regime makes human rights improvements. The 80,000 to 120,000 North Korean people inside those prisons camps are being exploited by Kim Jong-un as free labour to fund and architect his nuclear and missile weapons program. Reports indicate that some may even have chemical and biological weapons tested on them. Failure to reach a deal in Hanoi demonstrates the need to craft a more comprehensive policy toward North Korea one that see human rights and denuclearization as interconnected. Future diplomacy, if it's even possible, should reflect the multifaceted nature of current US law.